As I made my way down Flatbush Ave. time and time again, I asked anyone and everyone that I was taking home to Brooklyn what they thought of the building pictured above, as it was under construction. Doctors, teachers, parents, artists, office workers, waiters – nearly all of them had an opinion on it and it wasn’t good. They were afraid of the crowds, traffic, loss of character in neighborhood, and the rise in property values. With much fanfare last fall, the Barclays Center finally opened and the long-awaited redevelopment of the Long Island Railroad yards finally had some concrete results that people could see and judge for themselves. Of course, I was one of them since I attended one of Coldplay’s concerts there right before New Year’s. I’m not a huge fan of stadiums and arenas from an economic development standpoint. As much as I love my sports teams and the facilities they play in, it’s more of an aesthetic and design standpoint that I judge them from, and not whether they can bring a neighborhood back from a decline. As any New Yorker could attest to, the centerpiece of the greater project known as Atlantic Yards was more than just an arena for an NBA team. It was supposed to be a Frank Gehry-designed sports facility with loads of housing behind it and a skyscraper that would have been dubbed “Miss Brooklyn”, since it would have been the tallest in the Borough once completed. Most of those plans were scrapped in favor of the arena that SHoP ended up designing (to rave reviews) while the housing is still in limbo. What the final appearance of the yards will be remains anyone’s guess but the site already had a story that could be seen underneath the LED lights and exterior. For starters, there’s been a huge re-branding of the team that formerly resided in my home state. It shouldn’t come as any surprise that their primary color was chosen to be black since it’s a timeless color that doesn’t go out of style. The concourses and seats inside were this hue as well, leading me to believe that it was a done deal long before the team announced their new name and color scheme. Along with that was a huge proclamation that professional sports had returned to New York’s most populous Borough, long after the Dodgers had bolted for the West Coast half a century earlier and left Brooklyn without its own team to root for. Unfortunately, pro sports *had* returned to the Borough a few years earlier, just not at the Major League Level. The irony of the Nets rechristening as “Brooklyn” was the tale of the Dodgers and how they left the East Coast in the first place. Nearly everyone knows that Walter O’ Malley wanted a new Stadium for his team to replace the aging Ebbets Field. Robert Moses, who controlled nearly every City and State development agency in New York in the late 1950’s had a site ready for him…but it was in Queens. O’ Malley nixed the idea, packed up everything, and the following season, the Dodgers were playing their games in Wrigley Field (no, not that one in Chicago) before Dodger Stadium opened in 1962. Two years later, the expansion Metropolitans moved into a facility on the same Queens property that Moses had envisioned for “Dem Bums” and by then, there was a whole world of excitement next door with the World’s Fair going on in Flushing Meadows Park. …which is precisely where the Barclays center opened 55 years later. This isn’t a lesson on how the blackmailing of cities over sports venues can come full circle but rather, one in urban planning. Much like the MTA yards on the West Side of Manhattan, Atlantic Yards in Brooklyn represents the aspirations of a place looking to move into the future on one of the last blank slates in its cityscape. Cultural attractions, improved mass transit connections, housing, parkland, and open space are seen as the magnets that will draw the professional and affluent residents that 21st Century Cities will need in order to survive and maintain the tax base. Naturally, someone will end up being displaced and dismayed at the whole environmental and review process, which will ultimately turn out to be the residents and drivers (including yours truly) when all it said and done. 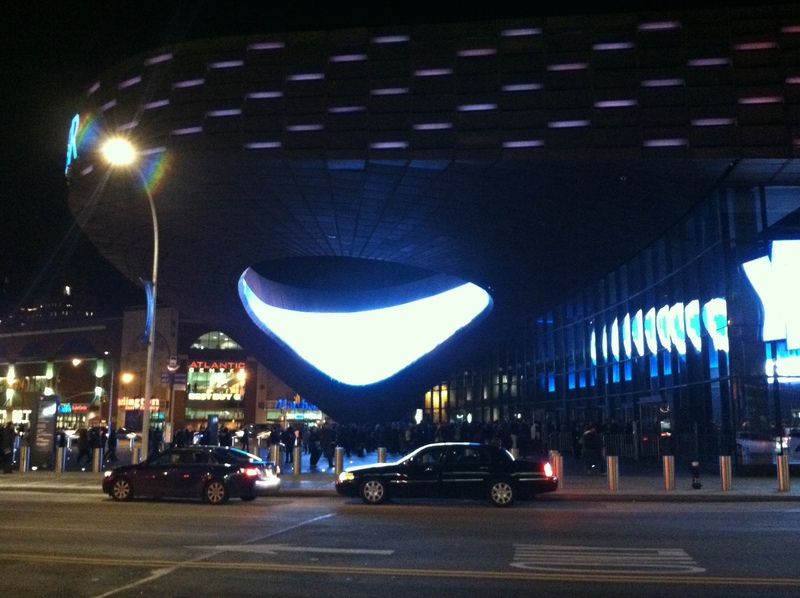 Much of the traffic patterns around the new Arena were screwed up for months during the construction of it, which had to be done on time for the Jay-Z concert that marked its opening. There still isn’t anywhere good for Yellow drop-offs and pickups, although the black cars have their own space for those functions. After all, Brooklyn is an Outer Borough! The locals who decried the monstrosity that arose over the railyards have no choice but to live with it now, and the high rises that are planned to go on the back side of it. Even if the entire project was cancelled, the wave of development that has crept over the Lower East River Bridges and settled in Downtown and Boerum Hill has already changed the appearance of the Borough forever. Rents are closer than ever to those in Manhattan and more people are commuting within Brooklyn now for work than ever before. As evidenced by the high ticket prices and cost of concessions at the Barclays Center, it’s not the only way that Manhattan has reared its ugly head in the former “Outer Borough”. As I’ve said before, a cabdriver told me once that when he used to drive people to Brooklyn, cops would tell him where Manhattan was and how to get back there since they thought he was lost. That’s no longer the case and as more people want to call the Borough home, the onslaught of high-end apartment towers, chain stores, and cultural amenities geared towards the rich will only continue to proliferate. Even though the Barclays Center is largely clad in weathered steel designed to invoke the surrounding industrial past, there’s no doubt that the building on the corner of Flatbush and Atlantic Avenues is from the future, and a harbinger of more change yet to come. 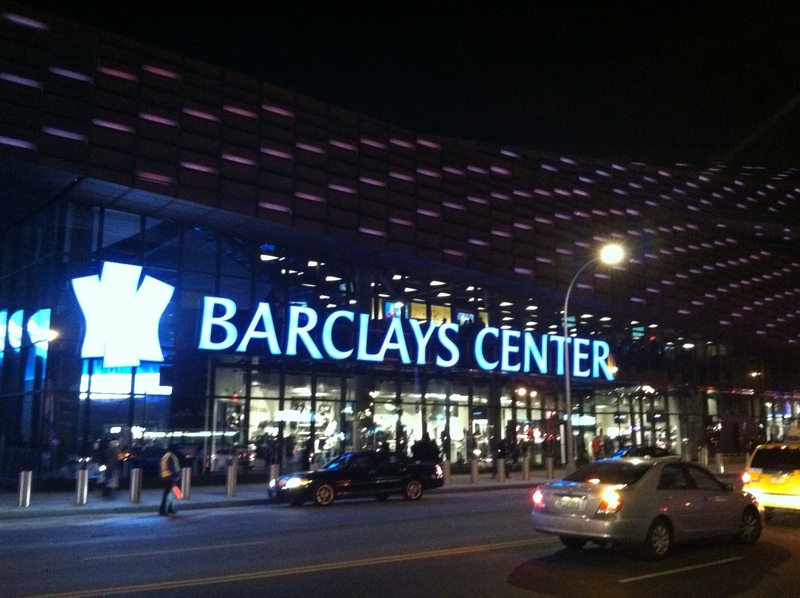 This entry was posted in Buildings, Uncategorized and tagged Barclays Center, Brooklyn.